October 16, 2008 – What I learned today! 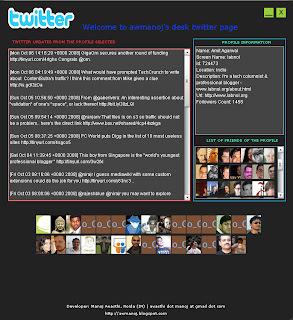 Desktop Twitter is an Adobe AIR desktop application written in Flex (Actionscript) which I wrote up few days back. It is an attempt to bring the twitter experience out of the browser. Current version of the application that am giving out so it contains minimal features. A screenshot is shown at left. Twitter Rest APIs are quite simple to use and developing any such application becomes painless using them. 1. On entering the user name of the user whose desk twitter page you wish to see, you get the list of thumbnails of friends of this user near the bottom. 2. On selecting any thumbnail you get to see the details of that user. Account information is shown in the right top box, twitter updates are shown in the left big box and thumbnails of the friends of the selected user are shown in the right bottom box. Missing – Help is missing for now but will be available in next release (soon) (Details of the different panels are intended to be clear by the labels provided. ). No caching of thumbnails is done and hence sometimes there may be some delay in loading of images. Application can be downloaded from here. You will need to install Adobe AIR runtime (takes not more than few seconds) to install (again, not more than a few seconds) and use this application. Please download the application, try it out and report any bugs, suggestions, features at awasthi.manoj@gmail.com.